The wristwatch was nearly killed off by the cell phone revolution, but with the rise of the smartphone it’s about to evolve into something more powerful than it’s ever been. Investors, and a number of industry heavies, have just acquired the smartwatch business of Meta Watch, as well as all its IP. The players include Juho Pinomaa, the former president of Sunnto (which makes dive computers, smart sports, and GPS watches), formerly of Nokia, and Bill Geiser and David Rosales, who used to lead the connected watch division of Fossil. The developer-centric Meta Watch is already due on sale this month, but these moves show that there’s serious interest in the future of the digital watch–and Meta is only one of the players. Lest you doubt the seriousness of these moves, consider that one of the players involved is Apple. Chances are, you don’t wear a watch and haven’t for quite some time. Meanwhile, your smartphone is shoved into a pocket, briefcase, or purse right now, and all your SMS’s, phone calls, Twitter updates, and Facebook statuses are reeling on in the fabric-lined darkness. It would be amazingly handy (pun intended), in a world where more and more of us “check in” to places, snap photos, and share status feeds at an ever increasing pace, to have all that possible on your wrist. Faced by shrinking sales of its traditional watches that really do little more than tell the time, Fossil began a project some time ago to develop a future connected watch–a digital device that would offer much more data to a tiny display. 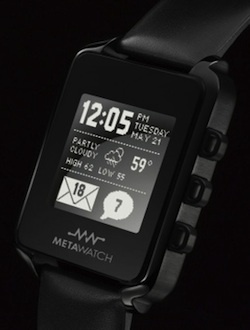 Meta Watch was the result, a mini computer, with Bluetooth and display, running a custom operating system. It’s now an independant entity, and it has an unusual remit: To appeal to developers and hardware hackers, to try to establish an ecosystem of apps and new ways of utilizing the display as an additional way to access what’s going on on your smartphone (mainly Android units, at first). And Meta Watch isn’t alone. In Italy, two entrepreneurs are busy finalizing the design of the I’mWatch. It’s tiny, slim, highly styled (and highly expensive–in some jewel-encrusted iterations it costs around $15,000) and unlike the Meta it has a full-colour display and sophisticated touch interface enabled by its own on-board Android OS. It’s on pre-order starting at €250 now, and is due to make its first public appearance at the ARM tech conference in just 44 days. Though the company is cagey about what it can be used for, its promotional material shows calendar apps, weather feeds, MP3 players, news feeds, Facebook apps, and Twitter too–and it’ll come with a bunch of pre-loaded apps as well as extras via the proprietary “I’mStore.” Though it’s compatible with the iPhone, the I’mWatch seems to be a cleverer implementation of something Sony tried with its LiveView innovation for its own Android units. These two devices are smart, sophisticated extra displays that run in addition to your smartphone and let you take some of the utility onto your wrist: They can buzz, for example, to let you know a call is coming in and prompting you to peep at the watch to see who’s calling–much easier than fishing a phone out of a pocket or bag–and if you were on a morning commute, you’d then perhaps decide to leave the call until later. But don’t forget Apple–its touchscreen iPod Nano was an unexpected hit as a watch, spawning a large industry in peripheral watch straps. Apple seems to, at first, have not expected the Nano to be used in this way, and though it sported an attractive analog watch display, it wasn’t enabled to pop up when the iPod was prompted from sleep–it took an update to make this change. But the existing Nano doesn’t have any connectivity, and while it does run apps, they’re all proprietary and can’t be changed. We know Apple is planning an update to the device, possibly adding in a camera–but that’s all we know. It’s possible Apple is planning something novel with the device to turn it into a full-fledged wrist computer, if not for this immediate update then for one in the near future. The first clue is the incorporation of Bluetooth 4.0 in newer Apple gear. The standard is a lower power consumption one than current Bluetooth hardware, thus improving battery life, and offers simpler “pairing” between devices–meaning it would be perfectly plausible for your iPhone or Mac to quickly, efficiently, and simply send data to your nearby Nano. 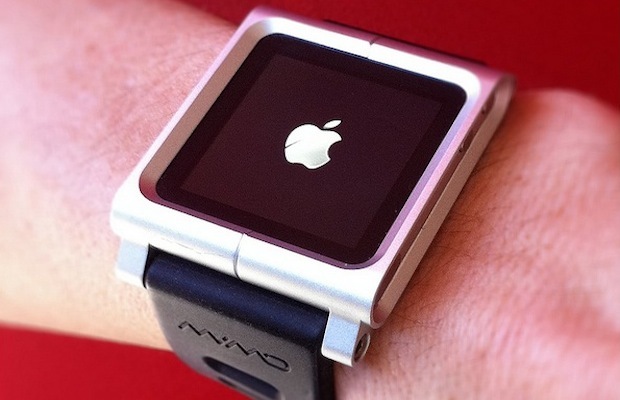 And with Apple’s control of the app ecosystem, a connected iPod Nano could become a powerful competitor to the I’mWatch and Meta Watch. You can easily imagine Apple building in a motion-gesture system to the device, meaning you’d simply have to shake your wrist to reject an incoming call on your iPhone. And though the prototype iPod Nano had a camera on the back, there’s not much to stop Apple adding it to the front or side of the device to act as a FaceTime camera or useful go-everywhere camera. With sophisticated voice recognition on the way for the iPhone, the tiny screen of a wrist Nano wouldn’t even be a barrier to updating your Twitter feed. And that’s why you’ll buy another wristwatch. Smartphones are, of course, incredibly powerful tools. But as they get more powerful, many seem to be getting slightly larger–even the iPhone 5 is rumored to be bigger, if flatter. 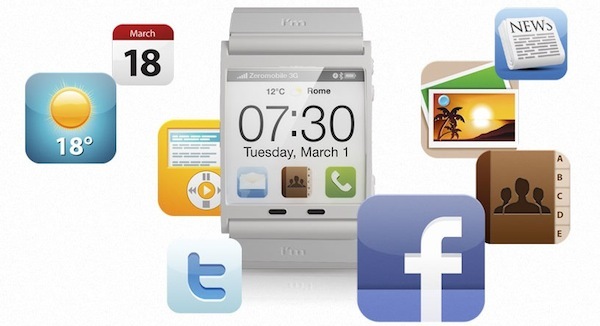 The always-accessible nature of a smartwatch may appeal to a generation who’re used to “checking in” on Foursquare everywhere they go, as well as basic status reading and updating on Facebook. And all those rumors of NFC payments get even more interesting if you consider that you could actually pay by simply waving your wrist over a sensor pad, with all the NFC circuits in the watch and its wristband, and all the hardware handshaking–including store loyalty cards and in-store downloaded ads–happening on the phone, securely in your pocket. Merely telling the time by glancing at your wrist? That time is over.